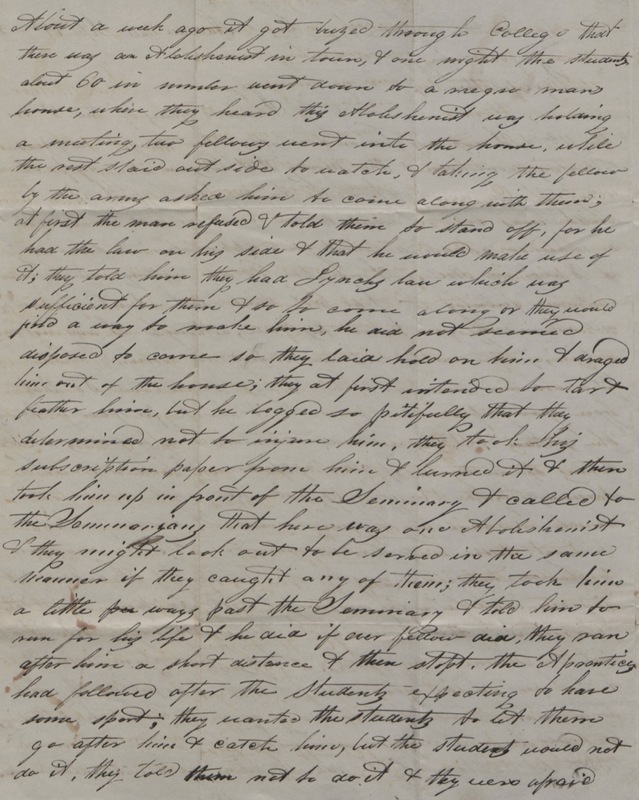 Letter from John Witherspoon Woods (class of 1837) to his mother, describing a student-led attack against an abolitionist. I received yours of the 8th on the 11th & I was very glad on account of two thing — the pleasure of hearing from home & the money that was it — My foot is entirely well now, & I intend to try to keep it so — It should always be my desire and endeavor to act in such a manner as shall meet to your approbation & so long as I am in College I will try to do nothing which will hurt your feelings — I do not think that Aunt Susan will accompany me home this fall, although I am not certain, if she makes up her mind to come, I will let you know three or four days beforehand so that you can get some person to work for you while she is there — I was indeed astonished as well as sorry to hear of the death of Mr. Mitchell — I am somewhat astonished that Mr. Konkling did not write as he said he would; according to your request I made further enquiry & Mr McClean recommended a young man in the Seminary by the name of Topping; I called at his room on Saturday evening & spoke to him about it; I told him all I knew, that the trustees gave $50 & that the number of scholars always have been from 12 to 14, & I also told him that it was probable, if he would teach the higher branches of the English studies, he would have a larger number, he said he would write to Father about it. Mr McClean recommended him.